Honorable Prime Minister of India Shri Narendra Modi is set to launch Prime Minister Social Security schemes on 9th May 2015 in Kolkata. One among the schemes to be launched by him is Atal Pension Yojana (APY) which aims to bridge the gap which exists in the pension system in India. It is known fact that majority of the Indian Population is not covered under any pension scheme as these schemes are costly and normally have a high entry barrier with the private pension companies. This scheme addresses the issue by aligning the scheme with the recently successful Jan Dhan Yojana wherein majority of the Indian citizens were able to open bank accounts. Jan Dhan Yojana(JDY) brought in a large proportion of Indian population into the financial net. Citizens working in the unorganized sector are likely to benefit immensely from this scheme as they are the ones who are covered with any social cover when they retire. APY aims to bank on the success of JDY and provide social security cover to all the citizens with a bank account in bank across India. This scheme will ensure that every Indian citizen saves today and invests to receive pension in his old age. The scheme will managed by Pension Fund Regulatory and Development Authority using the National Pension Scheme architecture. 1. Scheme is open to all citizens of India and a individual can opt for the scheme at a minimum age of 18 years and a maximum age of 40 years. 2. Fixed Pension will be paid to the subscribers which will range from Rs. 1000 to Rs. 5000 depending on the point of entry and contribution of the subscriber. Central government will also contribute Rs. 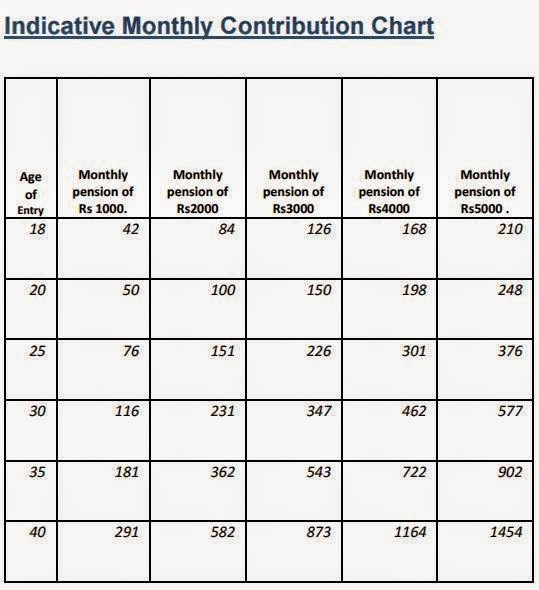 1000 or 50% of the total contribution which ever is lower to the scheme for every subscriber.You can see the necessary contribution chart below. 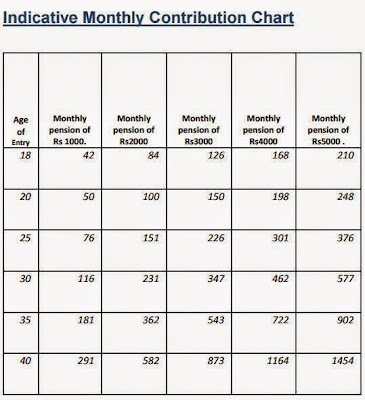 In case of age of 19 the monthly contribution goes up by Rs. 4 for monthly pension of Rs. 1000. Pension can thus be calculated using the following formula. In order to calculate pension for Rs. 2000 and so on multiply the above by 2,3,4 and 5 respectively. 3. To apply you need to have a bank account and a mobile number. Obtain the APY application form, give a self declaration and an authorization to auto-debit your account to the bank. You can download the Atal Pension Yojana Form from here. 4. Subscribers will be charged in case of default and are thus requested to maintain sufficient account balance in there bank accounts. Charges in case of default are. In case the default continues and account contribution is discontinued following will be done. 5. Exit from the scheme is permitted on attaining the age of 60 years and it is permitted earlier in case of death or terminal illness of the beneficiary. In case of death the spouse will continue to receive pension while in case of death of both the pension corpus will given to the nominee.